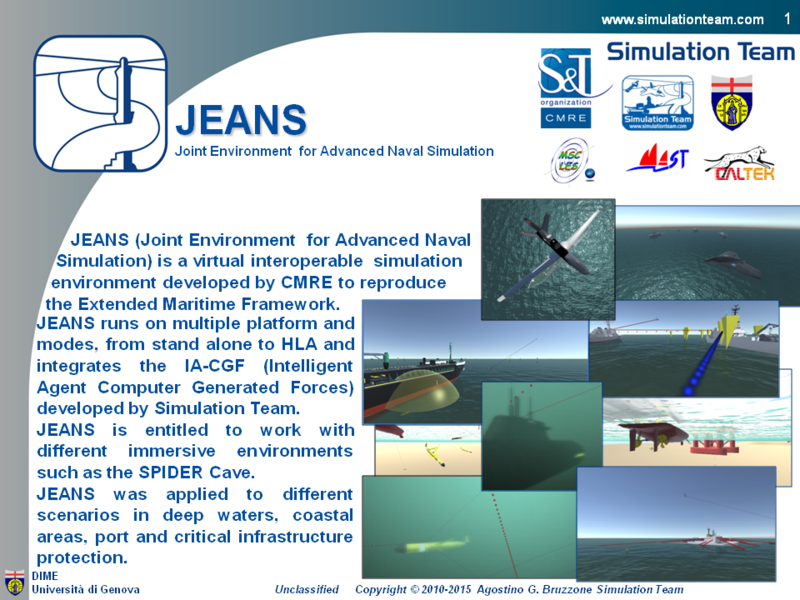 JEANS (Joint Environment for Advanced Naval Simulation) is a virtual interoperable simulation environment developed by CMRE to reproduce the Extended Maritime Framework. JEANS runs on multiple platform and modes, from stand alone to HLA and integrates the IA-CGF (Intelligent Agent Computer Generated Forces) developed by Simulation Team. JEANS is entitled to work with different immersive environments such as the SPIDER virtual interactive Cave. JEANS was applied to different scenarios in deep waters, coastal areas, port and critical infrastructure protection.